A pickup truck is always useful. No matter if you just want to carry a speedboat, a trailer or a cement mixer, the 2019 Chevrolet Silverado is perfect for all. In North America, full-size trucks have a long tradition. After all, there are many American who have hard jobs and need to transport heavy machinery from one place to the other. This ends up making the 2019 Chevrolet Silverado a great option. 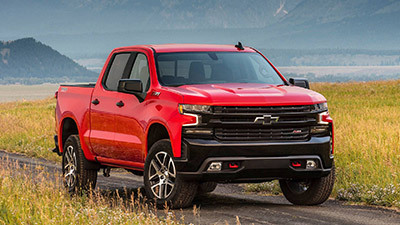 While there are great options on the market within this segment, the 2019 Chevrolet Silverado is definitely one big truck that you should consider. The good news is that the new 2019 Chevrolet Silverado is already available at dealerships. One of the things that you will b glad to know is that the 2019 Chevrolet Silverado is more affordable than its previous generation. Even though the difference isn’t big, the price for the base 2019 Chevrolet Silverado model is $29,795. Please notice that this price already includes the $1,495 destination charge. In what concerns the outside look of the 2019 Chevrolet Silverado, there are some changes that you might notice. The truth is that the 2019 Chevrolet Silverado just got taller and bigger. Nevertheless, it is also lightweight due to the use of different metals on the body and substructure. At the front of the new 2019 Chevrolet Silverado, you will love the massive headlamps and grille that include multiple layers and make it extremely attractive. On the rear, the detail that tends to catch more attention are the capital letters of the model across the tailgate. Under the hood of this new generation of the 2019 Chevrolet Silverado, you will find the latest 5.3-liter V8 engine that is capable of producing 355 of horsepower and 383 pounds per feet of torque. However, this isn’t the only engine. You can also opt for the 4.3-liter V6 engine that is able to produce 285 of horsepower, a 6.2-liter V8 engine that is able to produce 420 of horsepower, and a torque-rich turbocharged 2.7-liter 4-cylinder engine. Notice that a diesel engine should also be offered soon. In terms of the transmission, the 2019 Chevrolet Silverado comes with a new 8-speed automatic gearbox. As soon as you open the door of the 2019 Chevrolet Silverado, you will see a huge cabin. However, we have to say that we would like to see a better interior. The truth is that you will see a lot of plastics throughout the entire cabin. However, this is a work truck and it ends up serving its purpose. The driver seat of the 2019 Chevrolet Silverado can be adjusted in 10 different positions and both front seats and the steering wheel are heated. When you take a closer look at the rear seats, you will sit that they are just flat and plain. However, it seems that there is enough space for both heads and legs. While all the 2019 Chevrolet Silverado trim levels come with the infotainment 3 system, an embedded navigation system is only included on the top trim levels.